Shine the Divine: Creativity IS a Spiritual Practice: Got Moose? To all of my Christian friends, I wish you a very Merry Christmas! Wow, I hope the roof withstood those huge hooves. Great shot and perfect for monochrome. Very unique for black and white! Merry Christmas! Ha ha, love that moose! Oh, that's so funny! I love wind-vanes, and this is a fine photo. Hi! Great shot! No reindeer on my roof , but a real moose behind my house, they are hungry and having trouble finding food now.. I love that moose! Very cool! Merry Christmas to you and yours. And I wish you all the best in 2011. What fun, Laura. You got a laugh from me. And thanks for the seasonal wishes. Thank you for your Christmas best wishes. Love the moose. Where I live, I think the moose couldn't make up its mind whether to come on snow skis or water jet skis. The best perch is right on top of your house. There should always be time to be thankful and joyous and remembering grace , right? «Louis» thanks you for your recent visit to San Francisco Bay Daily Photo. HA! This made me smile!! Such a wonderful capture of this reindeer dancing proudly on the roof!!! LOL! Funny. :) I grew up in northern Minnesota. 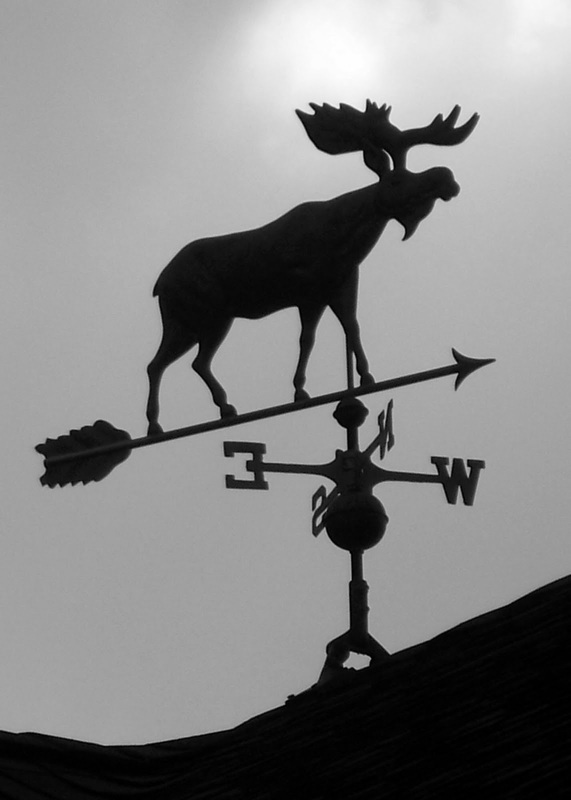 A Moose to show the wind direction dont need festival color, as the reindeer with red nose to show santa the right direction!!! ha ha ! Love it! I didn't have moose on my roof - but had one in my backyard. Have a Happy New Year. Christmas was great. All my children and grandchildren are here today. My friend, you are delightful! Wonderful! Hope you're having a great holiday. Wow, it's so unique and interesting! I guess I seldom see something like this...the common is chicken, right? Thanks for stopping by, Laura, and wishing you a wonderful and fantastic New Year!